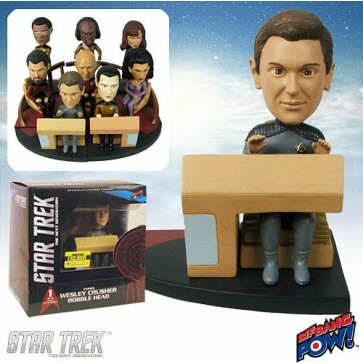 Starting off the line is a Convention Exclusive Wesley Crusher, available first at San Diego Comic-Con 2013. Ensign Wesley Crusher was a very popular character in Star Trek: The Next Generation.The son of Dr. Beverly Crusher, Wesley is shown here seated at a detailed L-shaped console on the bridge of the Enterprise. A limited edition of just 2,500 pieces, he measures approximately 7-inches tall and features an amazing resemblance to actor Wil Wheaton! Ages 14 and up.